The Couple is such a fast-paced read. I tore through it; you know a book is good when you read more than 60% in a day; it literally ate up my weekend. There is a lot going on in this book, but it makes for such a gripping read, and the tension simmers from the first page to the last. Claire works as an immigration lawyer for the Home Office, and her job is to defend their cases. At the beginning of the book, she and her fiancé, Angus are celebrating their engagement; everything should be perfect and happy, but something doesn’t appear right in their relationship. Claire already feels on tenterhooks, even before her stepfather mistakes Angus for her previous partner, Daniel in his speech. From this point on I knew that this was going to be a novel I was going to enjoy as Sarah Mitchell was starting to create a real sense of unease and I had to know how everything was going to unfold. Claire’s job as an immigration lawyer was fascinating, and you get to see what must go on behind the scenes in some of these cases, and I felt that this was an area which had researched well; I could sense the tension there was in the courtroom as we waited for the verdict to be given to the judge. Claire is such a perplexing character. You can see that something has happened in her past with her previous boyfriend, Daniel and I wanted to find out what had gone on between them. We do visit back to this time as Sarah takes us back five years earlier. Sarah ratchets up the tension as we get to understand more disturbing truths and what is really going on behind the scenes in Claire and Angus’s relationship. There was a final twist that left my head in a spin. I had to think about it for a while, I must admit, but once I did, I thought it was done very well, and there was a very satisfactory ending. This is the first book by Sarah Mitchell which I’ve read, and I’m very eager to read her next one. 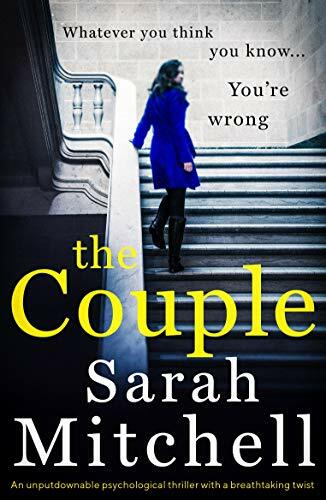 The Couple is an utterly captivating page-turner, it’s probably best to read when you haven’t got any plans for the day as you’ll want to continue reading on. Thank you to Noelle Holten at Bookouture for inviting me to take part in the blog tour tour and for providing me with an advance review copy. If you would like to purchase The Couple, you can do so by clicking on one of the following links below. I love a book I obsessively can’t put down. This sounds fantastic! Wonderful review!